OK, this is awkward for Hillary Clinton, the woman behind the man whose presidency appears to be the GPS navigator of the Obama administration. Not that those weren't good economic times, but I'm getting ahead of myself. It was Monday when openly lesbian Wisconsin Congresswoman Tammy Baldwin called on Secretary of State Hillary Clinton. She made a request that she says she has often made of Clinton's predecessor, Condoleezza Rice, but had been largely ignored: Please fix the inequities for gay spouses at the State Department. Her fight was joined by Senators Russ Feingold, a Democrat from Wisconsin, and Democrat Ron Wyden from Oregon, and Florida Republican Representative Ileana Ros-Lentinen. All very bipartisan; Baldwin is good like that. Clinton has long advocated for equal rights for gays and lesbians, but as First Lady and New York Senator she was not in a position to dictate change. As Secretary of State, however, she's the boss. This was Baldwin on a fact finding mission to see if Clinton was all tongue and no trousers. Baldwin's request asked the Department to grant gay spouses access to benefits, training and protections offered to straight spouses . The Department currently classifies gay spouses as “member of household,” a designation with few benefits other than housing. Gay spouses are not afforded training when following a State employee to an overseas post, access to medical services, or emergency evacuations. Baldwin called her list “quite extensive,” and said none of the changes would require Congressional approval. They were, in effect, Clinton's call. By Wednesday, the heat was on. Clinton had called for a State Department powwow, her first boss-to-employee heart-to-heart, and the pot was set to boil. “As one example, if I were assigned overseas to a post that came under a mandatory evacuation order, I would be required to leave, although the Department is under no legal obligation to do anything to help my partner. He could be left literally to fend for himself in a war zone,” Hill told Clinton. Clinton, the woman who said at the Democratic National Convention that she ran for president to fight for “deep and meaningful equality” and included gay rights in those marching orders, wholeheartedly agreed . That's good, but then comes the awkward moment with Bill's legacy, wait for it. Then Clinton reminded the group that the federal DOMA tied her hands in setting policy for gay spouses. The federal DOMA, you may recall, defines marriage as a heterosexual union for the purpose of federal agencies. 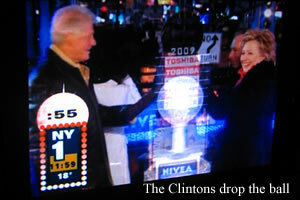 And the federal DOMA was signed by ... President William Jefferson “Bill” Clinton, her husband. Yes, I told you, very, very awkward. Who knew that fighting for deep and meaningful equality for gays and lesbians would run up against your own husband's legacy? Priceless. The Gay Slant is a weekly feature of On Top Magazine. Walter Weeks is a writer for On Top and can be reached at ww@ontopmag.com.